In North Carolina and across the country, there are hundreds of thousands of children who are in foster care. These are children who states and courts have found to be abused or neglected, or whose parents are unable to care for them. As a result, these children have been placed in the care of foster parents, with appropriate family members and friends, in group-homes, and in institutional settings. 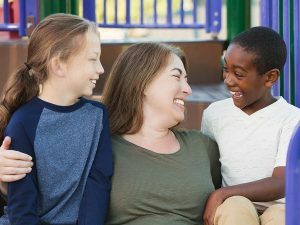 May is National Foster Care Month, the purpose of which is to bring attention to children in foster care, to celebrate foster parents, and to encourage the widespread support of foster children and their caregivers. New Direction Family Law firmly believes in child protection, and that every child has a right to live free of abuse and neglect. Foster families and relative caregivers deserve to be celebrated and recognized. These are people who have taken a risk, opened their homes, and gone to great lengths to provide 24/7 care for children in need of safety and stability. Honestly, being a foster parent is not glamorous, as they are being asked to provide care and comfort to children who have been the victims of abuse or neglect. These children come into foster care with a wide range of emotional and physical needs, and behaviors that reflect the trauma they have experienced. In addition to their negative experiences at home, they are forced to cope with the added distress that comes with being removed from their parents’ care. In other words, foster parents are asked to demonstrate an endless supply of love, patience, and dedication. Unfortunately, the cycles of child abuse and neglect are not going away, so there will always be a need for good foster families. If you know of friends or family members who may be good candidates, let them know about Foster Care Month and plant the idea. If you are in a position to be a foster parent, visit AdoptUSKids or call 877-625-4371 to obtain information about getting licensed by your local child protection agency. You are renting or own a home. Your marital status does not prohibit you from adoption, and you can adopt even if you already have children in your home. You must be able to pass criminal and child protection background checks. You must complete 30 hours of mandatory training. New Direction Family Law is a family law firm that represents people who are in the midst of separations, divorces, and child custody disputes. We take pride in the good reputation that our firm has established based on the record of our hard-working, tough-minded attorneys. With years of experience on our side, we want to help you move your life forward. Call New Direction Family Law today at (919) 719-3470 to schedule a consultation or visit us at our website.